Shalom uvruchim haba-im to the Thirty-Third Learn Hebrew Pod Newsletter. Learn Hebrew Pod’s Lesson 64 is dedicated to the memory of Yitzhak Rabin, the fifth Prime Minister of the State of Israel, who was assassinated while in office, on November 4, 1995. In our lesson, we will hear the personal stories of the Learn Hebrew Pod team, who will share their memories of where they were and how they heard about the terrible events of that night. We will hear an abridged version of Yitzhak Rabin’s biography, as excerpted from the website of the Yitzhak Rabin Center. And we will hear the words of Rabin’s family members and numerous world leaders as they spoke them at his funeral on Har Herzl. Yitzhak Rabin was one of Israel’s finest soldiers, a tireless defender of the State of Israel, both before and after its founding. As a statesman and political leader, he remained a fearless soldier... no longer a soldier on the battlefield; he became instead a soldier for peace. It was as a soldier in the struggle for peace that Yitzhak Rabin gave his life. It is in this way that he is unceasingly remembered in Israel. And it is in this way that his presence is most sorely missed. 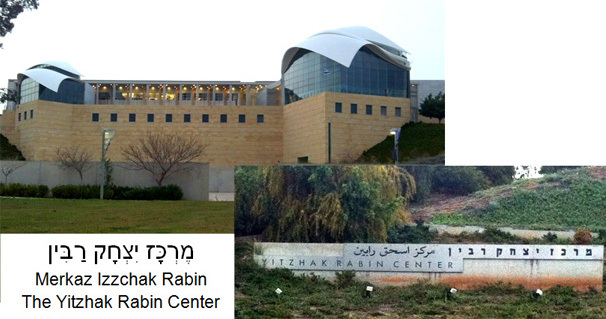 Merkaz Izzchak Rabin - High atop a hill overlooking the Yarkon River and the Tel Aviv skyline sits the Yitzhak Rabin Center--a library, research center, and museum dedicated to the memory of Yitzhak Rabin. The extraordinary museum explores in parallel the history of Israel’s society and democracy and the life and career of Yitzhak Rabin. Just as the museum honors Rabin’s role as a peacemaker, so too does the building in which it is housed--with its roof designed to be reminiscent of the wings of a dove. Kikar Rabin - Just one week following his funeral, at a memorial rally attended by hundreds of thousands, the square in which Yitzhak Rabin was assassinated, Kikar Malchei Yisrael (Kings of Israel Square), was renamed Kikar Rabin. 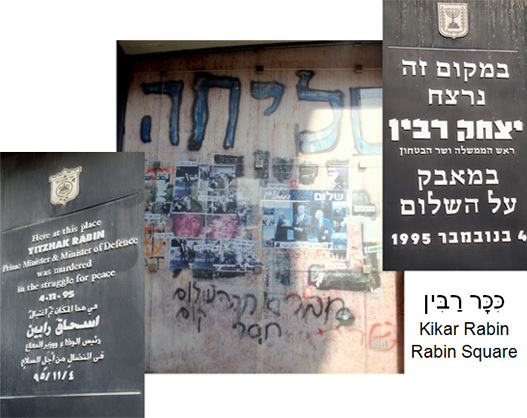 Perhaps Tel Aviv’s most central public space, every event held here now holds a small piece of Yitzhak Rabin’s memory. Yom HaZikaron le-Izzzchak Rabin -The Knesset (the Israeli Parliament) has declared the 12th of the Hebrew month of Cheshvan as the official Yitzhak Rabin Memorial Day, though it also widely observed on November 4th,the anniversary of Rabin’s death on the Gregorian calendar. 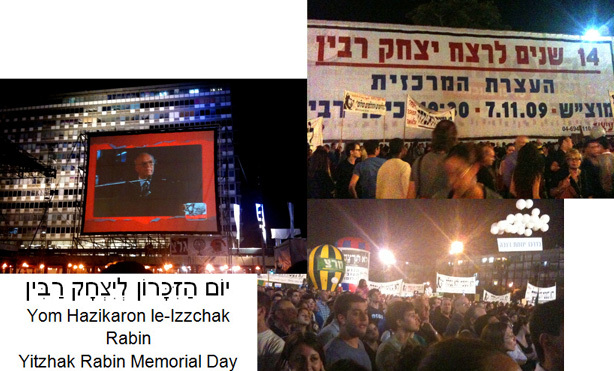 Each year memorial rallies are held throughout the country, with the largest being at Kikar Rabin. Tens of thousands gather to hear once again the words he spoke in that very spot at the peace rally on November 4, 1995. They sing once again the song he sang that night--Shir la-Shalom, A Song for Peace. And they pray that his death will not be in vain as they struggle to fulfill his legacy. This lesson is dedicated to the memory of Yitzhak Rabin, the fifth Prime Minister of the State of Israel, who gave his life in pursuit of peace. on November 4, 1995. May his memory be blessed. Listen to Lesson 64 on our website. A very special visitor joins us for Lesson 63. No' it's not Bobby Fishcer... but someone we all know and love. Let's listen as he shares with us his new love and gives us a chess lesson . . in Hebrew! Listen to Lesson 63 on our website. "Why is this night different from all other nights of the year?" The Passover story unfolds as we seek the answers to the Four Questions. Learn to ask the Four Questions. Wash our hands (without a blessing). . ."
The Passover Seder has a prescribed order... the word "seder" itself means order, and here's where we spell it all out.